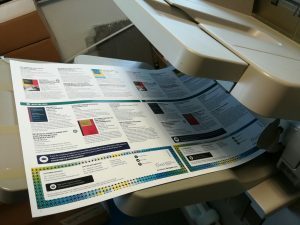 Orchard Press offers high-quality digital printing services. We have invested in a Heidelberg Ricoh Pro Digital Press to offer you flexibility and meet your need for a cost-effective solution. Whether you require low quantity flyers, leaflets, posters, mail shots or short run printing, we can offer you flexibility and a quick turn around. Printing is available on a range of specified quality papers of different stocks, on coated or uncoated and up to 300gsm in full colour. We will then fold or finish as per your specifications. All sizes up to A3 including 6-page roll folds printed both sides. If you need any more information about our digital printing services or an upcoming project you need advice on, please get in touch and Adrian will be happy to assist.